Their services can include running a diagnostic eye over your backyard, brainstorming sessions on design or plant selection, a spot of magazine browsing or a guided tour of your local garden centre. 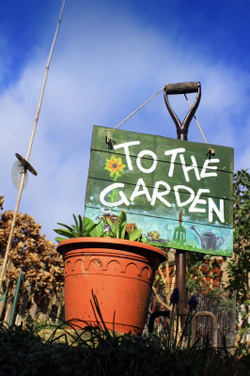 You'll be advised on where to find those unique items to add a personal touch to your garden. There's hands-on training in potting, planting, mulching, watering, dividing and deadheading. Best of all, because you're paying for it you can do as little or as much as you want. A garden coach gives you the confidence to say: "I can do it!" What's most surprising about this rapidly filling gap in the self help market is that it has taken us so long to realise we need coaching. Who would have thought that, for the price of a designer haircut, you could be greeted at the nursery by a headband wearing, track-suited cross between Trinny and Susannah and Prof Walker. Thankfully local garden coaches like Lester Brice don't expect you to strip off and expose your wobbly bits to the world. Lester has been coaching Kiwi gardeners for twelve years. When we spoke to him, he was "in a garden in Remmers watching my client fall into the gardenias". "My aim is to offer empowerment and enthusiasm to people who have become disillusioned with their gardens,"